In2Eyes is proud to be offering Ultra-Wide Digital Retinal Imaging alongside our comprehensive eye examinations. The optomap ultra-widefield digital retinal imaging device helps you and your optometrist make informed decisions about your eye health and overall well-being. The optomap® Ultra-Wide Digital Retinal Imaging System captures an ultra-widefield view of the retina in a matter of seconds. The 200 degree internal scan enhances clinical care, patient satisfaction and practice efficiency. It is performed quickly and easily enabling your In2Eyes optometrist to spend more time analysing, diagnosing and educating rather than gathering information. The optomap® also provides a permanent image to store your medical record, which assists us in tracking subtle changes in the retina over time. Recent clinical research shows that the optomap® Ultra-Wide Digital Retinal Imaging System enhances the comprehensive eye exam. It has also successfully aided in the diagnosis of diabetic related retinal diseases, hypertension, melanomas, and identified the risk of congestive heart failure. The retina is a delicate lining at the back of the eye similar to film in a camera. Light strikes the retina through the lens in your eye and produces a picture which is then sent to the brain, enabling you to see. Why Is A Healthy Retina Important? An unhealthy retina cannot send clear signals to your brain which can result in impaired vision or blindness. Most retinal conditions and other diseases can be treated successfully with early detection. Without a comprehensive eye exam, you may not be aware of a potential problem. You may see clearly, and because the retina has no nerve endings, you may not feel any pain, a symptom which may otherwise have prompted you to see your doctor. What Can Happen To The Retina? 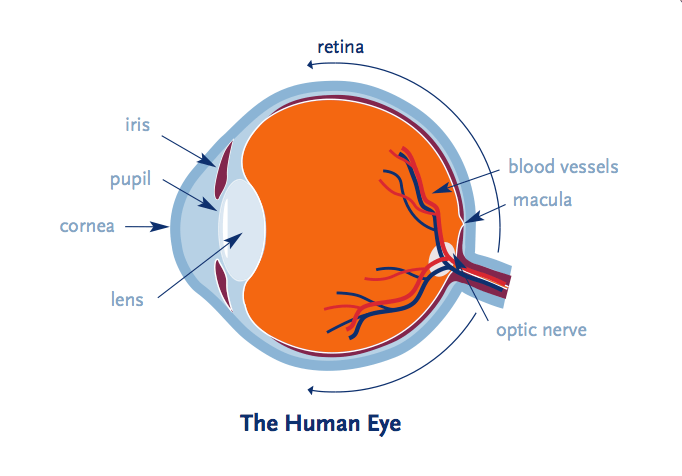 Your retina is the only place in the body where blood vessels can be seen directly. This means, in addition to eye conditions, signs of other diseases (for example, stroke, hearth disease, hypertension, and diabetes) can be seen in the retina. Early detection is essential so treatments can be administered. Diabetes affects the eyes and the kidneys and is a leading cause of blindness. Retinopathy occurs when diabetes damages the tiny blood vessels inside the retina. The center of the retina (the macula) can become diseased as we get older. This results in alterations to our fine central vision making daily activities such as driving and reading difficult. Glaucoma causes damage to the optic nerve and almost always develops without symptoms. of cardiovascular disease (stroke or heart disease). 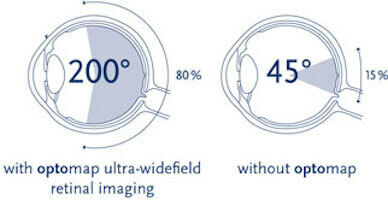 How Does Optomap Widefield Imaging Help? The optomap ultra-wide digital retinal imaging system captures more than 80% of your retina in one image. Traditional methods typically reveal only 10-45% of your retina at one time. The unique optomap ultra-widefield view enhances our ability to detect even the earliest sign of disease that appears on your retina. Seeing most of the retina at once allows your eye doctor more time to review your images and educate you about your eye health. Numerous clinical studies have demonstrated the power of optomap as a diagnostic tool. Do All Optometrists Have An Optomap? Optomap is the new standard of care for evaluatingeye health in this office and millions of people worldwide have benefited from optomap. More than 50 million optomap widefield digital retinal scans have been performed worldwide since 2000. Your doctor will advise you based on your individual circumstances, but the general recommendation is that you have an optomap every time you have an eye exam. This will ensure you have a digital record of your retinal health on file which can be compared for changes over time. Should My Children Have An Optomap Too? Many vision problems begin at an early age, so it’s important for children to receive proper eye care from the time they are infants. Will I Need To Be Dilated. Does It Hurt? An optomap takes only seconds to perform, is not painful, and typically does not require dilation. However, your optometrist may decide dilation is still needed. in one eye because a retinal detachment was detected too late for treatment. Although he was having regular eye exams, conventional tests were uncomfortable, especially for a small child. I sought to find a way to make retinal examinations easier. Leif, now a young man, has adjusted beautifully and we are thankful to, hopefully, help other families avoid vision loss. No. It is completely comfortable and the scan takes less than a second. optomap images are created by non-invasive, low-intensity scanning lasers. No adverse effects have been reported in over 50 million sessions.